Cut pork belly into about 7-inch long and 1-inch thick pieces. Use a fork and poke both sides of the meat for the marinade to be absorbed. In a medium bowl, add in fish sauce, white pepper oyster sauce, sugar and mix well. 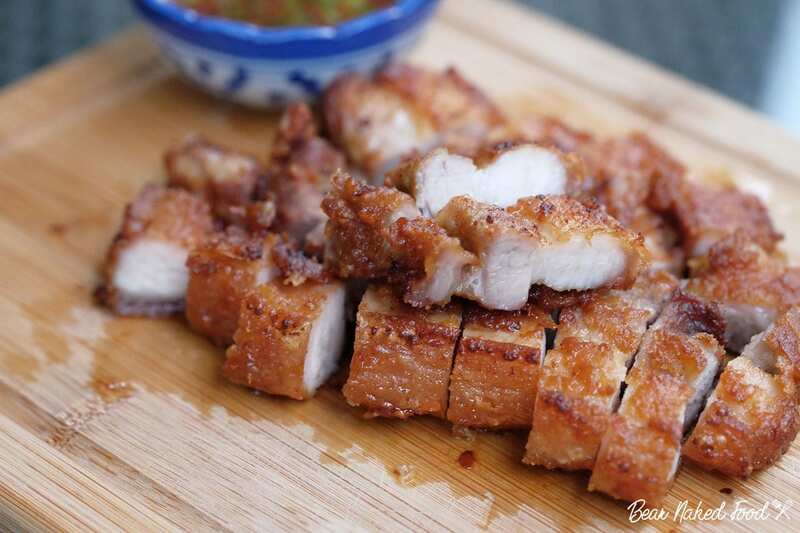 Place pork belly in a shallow tray and pour marinade all over, rub to distribute evenly. Dust the flour all over to coat both sides of the meat. It will help to bind the marinade. Let it sit at room temperature for 30 minutes. If you are prepping this in advance, cover with cling wrap and store in the fridge. Make the dipping sauce by adding all the ingredients in a small bowl (except the toasted rice powder) and mix well. Taste and adjust with more lime juice if necessary. Set aside. Heat the oil in a frying pan or wok over medium heat. Using a pair of tongs, carefully add in the pork belly and fry for 8 to 10 mins over medium heat, until deep golden brown. Remove and drain on paper towel for 5 minutes before slicing into bite size pieces. Before to serve, mix the toasted rice powder into the dipping sauce.